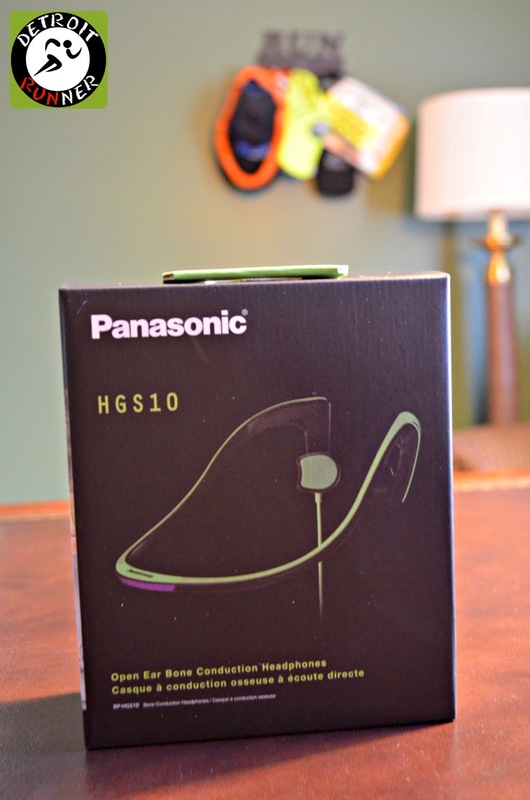 Several weeks ago I received a pair of new Panasonic headphones for review. Full disclosure - these were provided to me at no cost through their #OpenYourEars challenge in exchange for my review. Check out what I received. They sent a nice little runner's package with the headphones as well. Very cool! The headphones are different that your typical headphone in that these use Bone Conduction. Bone conduction means that the headphones sit on your cheek bones. The sound is transmitted through the upper cheek bones of the face to the cochlea of the inner ear. 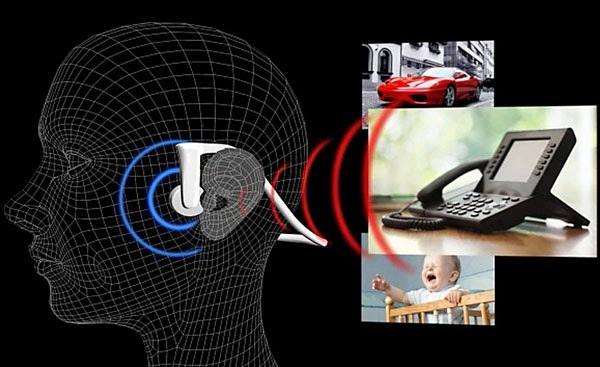 This allows for listening to music while also still being able to hear sounds around you. The headphones are wired and sit on your cheek bones just in front of your ears. The headset itself is very comfortable and goes around your head. This keeps them sitting somewhat on the back of your neck but you really don't notice it much when you are running. They also don't bounce around and stay in place in front of your ears. The sides are very smooth as well and I didn't experience any type of chafing on my head. Of course, the biggest advantage is that the headphones don't actually go in your ear so you are able to hear cars around you. As a runner who runs in the dark mid week, I have primarily two things I worry about while wearing headphones then. The first is that I worry I won't hear a car coming up on me even though I run against traffic. You really need to be on the defensive when running in the dark mornings and this helps you do that. A disadvantage to these, however, is that you don't hear the music as well on a busy street. It takes a little getting used to not hearing it like it is when you have them actually in your ear but safety is a priority for me so I will sacrifice a little sound quality. I did tend to turn them up a little louder but could still hear the cars coming. The second issue I worry about is that someone would come up to me from behind that I didn't hear. These headphones also really help with that too since they're not in your ear. Not that I see that many people at 5am when out running but I like to be more alert to my surroundings. These are also sweat and splash proof. I've only run in them once when it was raining in a mist, but they worked just fine then. I also like how the end of the cable cord is and the fact that the cable is only on one side. For me, I tend to go through many pairs of headphones and the end(connected to my ipod) as well as the entire cable really takes a beating. I like the larger, better quality end to help it from wearing the wire connection out too quickly. For me, that's the part that wears out the fastest while running. Overall, I have enjoyed running in these and they make me feel safer when running which is the point of the product. Interested in learning more about them? Go to the Panasonic website to check them out. They retail for $79.99. They also feature them in wireless for $199.99. I want to thank Panasonic for the opportunity to test these out. If you are looking for Safety but still want your music, this is the way to go. Disclosure: I received a pair of Panasonic Headphones in exchange for this review. All opinions are my own and I was not required to give a particular opinion except an honest one. That's a really neat idea, I've never heard of bone conduction before. A lot of earbuds hurt my ears after a while, so I like the idea of something that doesn't go in the ear. And I especially like that they have a "wired" version - with all the apps I have running on my phone (gps, intervals, music, etc. ), I don't like to use Bluetooth at the same time because I'm always worried the battery will die during my longer runs. I wish there were a way to try them out before spending $80, though, since it seems like the sound quality/volume is significantly different from what we're all used to. the problem I have with the normal earphones I got with the cell phone is one of them always wants to fall out when running... I don't listen to music often enough to spend money on those, but they look great and would use them if I had them. The price has really come down! They are around $22 on Amazon right now. These headphones give the most noteworthy quality sound listening knowledge conveying full wide scope of sounds,beoplay h8i and dispose of outside clamors.